Con jamón de york y queso "super cremoso"
"It 's quite something. Italy has one of the best gastronomies in the world, so rich, that each region has its own culinary identity. The Trattoria Sant Arcangelo offers the best dishes of each zone, and moreover, in one of the most distinguished neighborhoods in Madrid, the Jerónimos. With more than 15 years of experience, its a sophisticated place where renowned people and artists cite. The menu of the trattoria is a compendium of the best of Italy. Try their specialties like the vitello tonatto or any of its rices, pastas, or pizzas. The wines that they offer and the background music complete an environment where chic people go to enjoy an excellent evening in all its details. 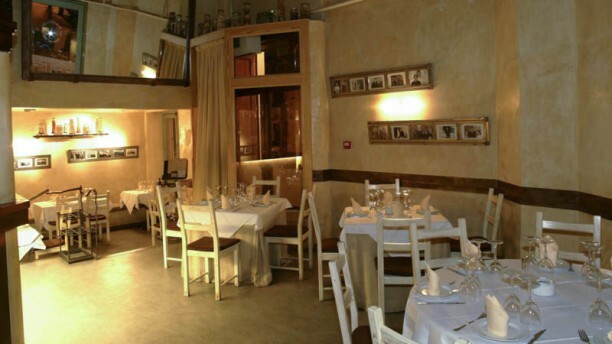 Enjoy Trattoria Sant Arcangelo." No se aceptan reservas por internet para la terraza. Food was great, service could have been more welcoming. Food a little bit salty but the taste was amazing! Inattentive service and so so food. Romantico, agradable y muy rico. Totalmente recomendable. Great food (value for money) plus great service!